DOmedia makes it easy to find, plan and buy out-of-home media in one powerful, integrated system. Find Media: Discover creative advertising ideas. Create Maps: Pinpoint hyper-targeted inventory. Build Plans: Create a media plan with no phone calls. Manage Proposals Get better proposals, faster. Or, sign up for a free account and get started. Search by market, zip code, proximity & more to find the latest alternative, traditional and digital out-of-home media products. Geography: Perform broad, multi-market searches or hyper-local, proximity targeting. Media Category: Select among 38 categories including billboards, digital networks, alternative & emerging media. Venue Targeting: Help prospects find you online. Request Quotes: Get a media quote for your campaign in just a few clicks. 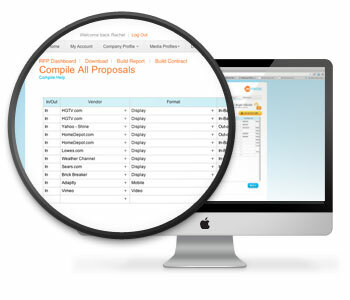 DOmedia’s Request for Proposal (RFP) process just got easier with the new RFP 2.0. Create a standard template to be used across your company. Easily compare multiple vendors' proposals side-by-side in a uniform data table. You get to save time & money with RFP tracking in real-time. Faster: Build custom standardized templates online in just a few clicks and strokes of the keyboard. Smarter: Send out your project brief and wait for proposals to roll in. Automated reporting for your proposals creates data-driven decision making. Better: Manage all your RFPs & proposals in one, organized interface. Share RFPs with colleagues to collaborate on campaigns. Download all proposals in one table for easy vetting of proposals. You can connect with over 700 top media vendors across 43 media categories without leaving DOmedia. Every OOH Category: Over 43 media categories across traditional, digital, alternative & emerging OOH media. Still in Business: We audit every media seller to make sure someone is there to answer your media request. New Vendors: We keep track of the latest companies & add dozens of new vendors each month. DOmedia gives you the tools to easily create & share interactive media maps to help you visualize ad opportunities. Compare Vendors: Decide if Company A or Company B has better locations for your ad campaign. Proximity Targeting: Find out which media is closest to your client’s locations. Discover New Media: Type in your market or zip code and see what media is available in your backyard. Share: Build a map & share the link, no download required. Say goodbye to JPEG maps. Go beyond pictures & descriptions and tap into the information you need to build a media plan, without picking up the phone. Organized: Information is organized into product & company profiles for easy access. Pricing: The latest media rates are listed & available by product and location. Locations: Easily find out if a vendor offers media in your target market. Impressions: Compare the reach of media across categories, companies and locations. Demographics: See if a media product is the right fit for your target audience. Media Kits / Case Studies: Download the latest media kits & case studies to complement your pitch. Creative Specs: Gather creative specs ahead of time without the need for email correspondence. Dedicated customer support so you'll never get stuck. We're not just tech people, we're your support team. We'll help you use DOmedia to execute your campaigns and train your vendors. Search Expertise: Can't find what you're looking for? Our media search experts will dig through our database to help you. Training: We'll schedule 1 on 1 demos or even send a live media expert to train your team on DOmedia's software. Vendor Management: We'll train your vendors and keep their inventory information up to date for you to access. Phone, Online & In-Person Support: All of our employees are trained to answer your questions via phone/email, or visit support.domedia.com for a library of video tutorials & tips.